An earthy elementalism provides the texture and grit of Melinda Palacio’s How Fire Is a Story, Waiting (Tía Chucha Press, 2012). I recently reviewed Lo Kwa Mei-en’s debut collection Yearling and discussed that poet’s use of elemental language, but the elementalism there was dreamlike and metaphoric, the sea and the sky and the ground used figuratively to describe the chaos and upheaval of the human spirit. Here the elements are literal and tangible–dust on feet and dirt dug up for a grave, water flooding a home or a river crossed to a new country, air warm from the ocean or choking in the city. Only the fire of the title remains largely figurative, a storm of life burning under skin exposed to a harsh world. The book is divided into four sections, each titled for the elements. The first is for fire, and this opening section beats with the pulse of early curiosity, passion, fear, anger. In the title poem that opens the book fire almost is life, holding the passion and identity passed down to the child/poet from her grandmother. Palacio writes in this section about being the child of immigrants, growing up in South-Central Los Angeles, and coping with a father who was in and out of prison and in and out of her life. Her imagery for the most part stays rooted in the real but for a few places where fantastical images are pulled in to highlight very real dangers. In “El South-Central Cucuy” she writes of the titular monster who serves as the Mexican equivalent of the bogey man, telling us about her uncle teasing her that El Cucuy will get her if she doesn’t behave. This is juxtaposed against the revelation three people were killed on her street by gunshot around this same time. Several poems in this section are a similar balancing act between childhood innocence and a harsh awareness of the pain and danger of life. In three especially moving poems about visiting her incarcerated father (“Things to Carry”, “Remembering Persephone”, and “Names and Numbers”, pages 23-25) she achieves poignant and painful resonance with simple lists, counting off things to take to the visitation, steps to seeing her prisoner, and things she does and does not remember about the man. “One key on a simple ring. Twenty one-dollar bills for the vending machines. A sealed package of tissues. The second section is titled Air Carries Her, and it is in this section we see most clearly into Palacio’s Latina cultural heritage. The air here is both a wind sweeping her along to new places in life and the life-breath surrounding her, filling her lungs. Some of the poems from this section are the lightest of the collection, offering a reprieve from the harder truths of the book, but more often this buoyance mixes with melancholy. In the remarkable “The Framed Virgin” (page 41) Palacio tells the story of her grandmother’s answered prayer to the eponymous Virgin for a girl after giving birth to nine boys, and how that girl married a black man from Panama, Melinda’s father, and eventually had Melinda. The poem is simple and unadorned, yet its very simplicity allows the power of this story and its emotional impact to be keenly felt. A similar style and effect is felt “Sin Vergüenza Swagger” (page 48) in which Palacio reflects on her father’s homeland, the land that shaped him, a land that helps explain him to her. The ambulance guy is cute, the note said. The driver is good too. She managed to scrawl a smiley face, her last signature. 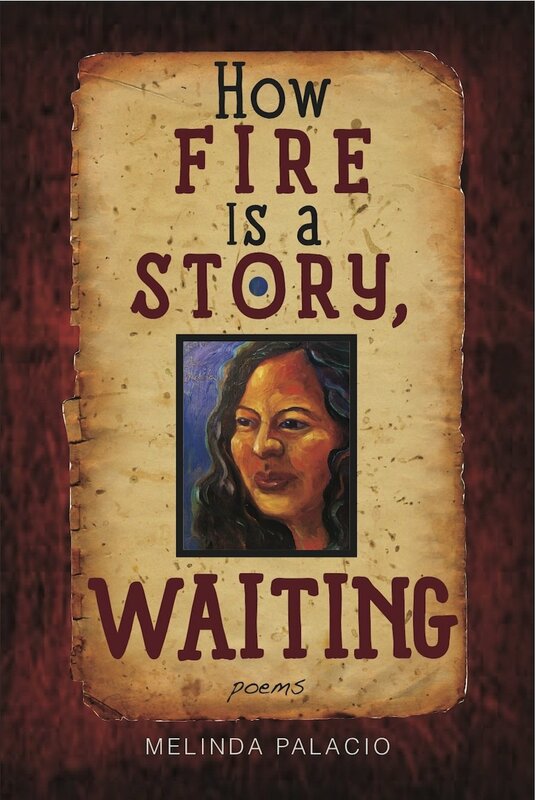 How Fire Is a Story, Waiting is a beautiful collection of poems from an important young poet. The book is both a deeply personal account of a life and the lives that have touched it and a portrait of a broader experience, that of immigrants and their children, who find both life and trouble in these borders. I look forward to reading more from Melinda Palacio.